Cheim & Read in cooperation with the Joan Mitchell Foundation is pleased to announce Joan Mitchell Sunflowers, an exhibition of paintings and works on paper by the artist. The earliest date from the late 60s and culminate with large diptychs painted the year before Mitchell died in 1992. The show is accompanied by a full-color catalogue with an essay by Dave Hickey. It is co-published with Steidl. Born in Chicago in 1925, Mitchell received her BFA and MFA from the School of the Art Institute of Chicago before establishing herself as a formidable talent in postwar New York's avant-garde scene. In 1951, her work was exhibited alongside that of Jackson Pollock, Willem de Kooning, and Hans Hoffman in the celebrated "Ninth Street Show," which marked the ascendancy of Abstract Expressionism within the development of modern art. Exemplifying the ideals of the New York School, Mitchell's paintings wager all on the expressive potential of the painterly mark itself, freed from the constraints of traditional representation. Given the macho posturing for which the movement's adherents have earned a reputation – almost all of them were men – Joan Mitchell's prowess in this milieu is all the more remarkable. She has since been the subject of numerous museum exhibitions, and examples of her work hang in nearly all major public collections of modern art. Mitchell left New York and the United States for France in 1959. After spending the better part of a decade in Paris, she relocated to Vétheuil in 1968, a town on the Seine about 40 miles north of the capital. There in her studio she embarked upon a body of work whose subject matter derives from the sunflowers that thrive in the golden sunlight of the Seine valley. She would return to this source material periodically throughout the rest of her career. In the history of art, sunflower imagery is most commonly associated with Vincent van Gogh, whom Mitchell admired, and whose treatment of the subject ranks among the triumphs of early modern art. Indeed, Abstract Expressionism's roots can be traced back to the Dutch master himself, via German Expressionism. (Recall here, as well, Emil Nolde's sunflowers.) Certainly, Mitchell viewed van Gogh's precedent as a challenge to herself. One feels his hand in her deliberate brushwork, which asserts its independence from the worldly things it would otherwise depict, and one discerns his eye in her palette of ochres and cadmium yellows, tinged here and there with blue or green. It is worth noting, too, that van Gogh, like Mitchell, conceived of his sunflowers in the context of a move from Paris to the French countryside, where he would share a studio at Arles with Paul Gauguin. More importantly, though, both Mitchell's and van Gogh's sunflower paintings were understood by their creators to sustain a sense of promise. Van Gogh planned to decorate his studio with his, in exuberant anticipation of Gauguin's arrival. As for Mitchell, in reference to one of her own sunflower paintings, the artist remarked in her characteristically blunt, matter-of-fact way: "It's a yellow painting. There's hope." 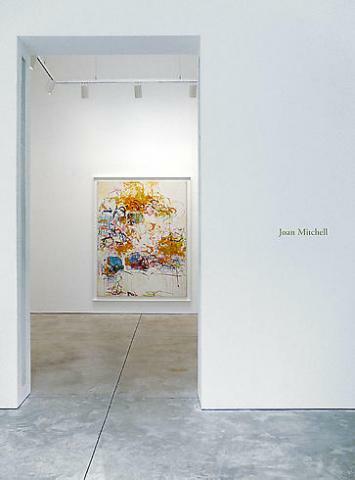 Mitchell, however, goes beyond van Gogh in the paintings, pastels and etchings exhibited at Cheim & Read, which is not at all to diminish her predecessor's status, only to suggest how Mitchell was able to tap into the store of latent energies surging in his work. Unlike van Gogh, who in the Nineteenth Century could not yet imagine a wholly abstract art, Mitchell mobilized her artistic will to liberate the constituent elements of painting— line and color, composition and gesture—from their servitude to the fleeting appearances of the material world. In so doing, she makes good on the true promise of van Gogh's practice: to hasten the stirrings of the unfettered spirit.